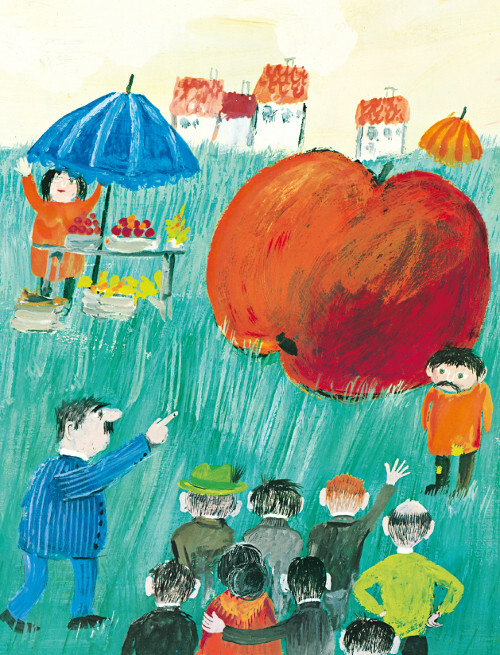 Today I’m going to jump way back, though, to 1965; if we don’t have as many new books to explore, let’s look at this one, originally published in Switzerland and created by a German author-illustrator. 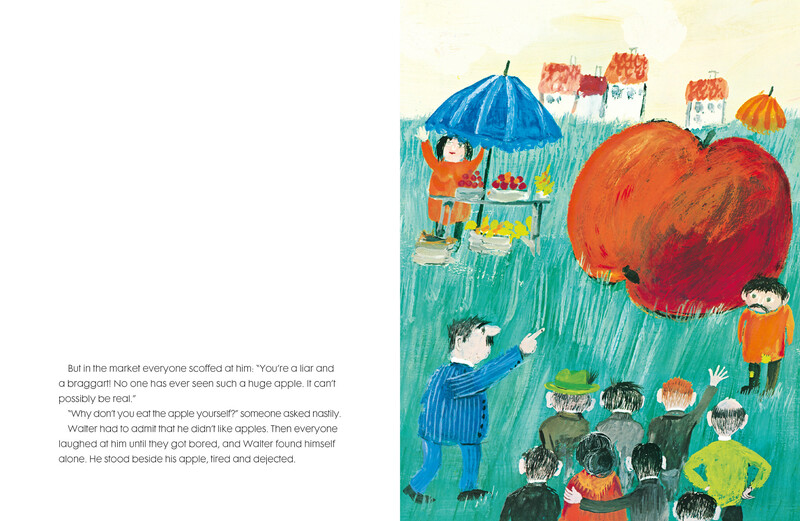 Just One Apple comes from Horst Eckert, whose pen name is Janosch. NorthSouth re-released this here in the States in September of this year. Turns out, though, that a giant green dragon descends upon the town and taunts the kingdom. 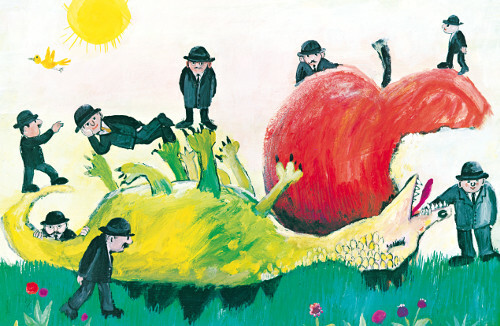 In the end, the king’s “detectives” feed the apple to the dragon, who chokes and dies on it. (See above.) The kingdom is saved. 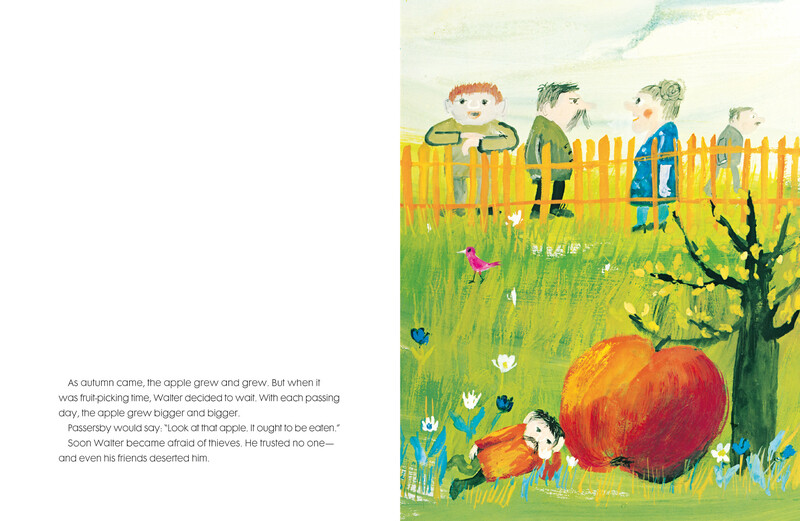 Walter was happy again — and this time only wishes for two small, basket-sized apples. Jonosch’s art is new to me. This is one thing I love about publishers like NorthSouth — that they give us a window into illustrators from overseas with much different sensibilities. 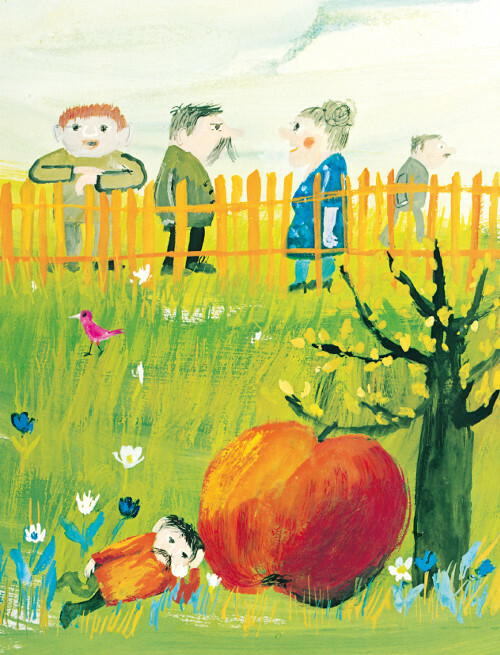 I’m struck by how Janosch’s art reminds me of John Burningham’s art (British) in more than one way. Here are a couple more illustrations. Enjoy. “But in the market everyone scoffed at him: ‘You’re a liar and a braggart! JUST ONE APPLE. Copyright © 1965 by NordSüd Verlag AG, CH-8005 Zürich, Switzerland. English translation cpyright © 1989 by NorthSouth Books, Inc., New York. This edition published in September 2014. Illustrations here reproduced by permission of the publisher. I’m not familiar with this title, but going to race out to get a copy right now! The painterly naive quality is really intriguing! I here a copy of Jonosch’s Musicians of Bremen, but the style is handled a little differently in that it’s executed in water color. Fun! I’m mad for Janosch! Thanks for posting! I love the colors here. Thank you for sharing!